[AWS] is the overwhelming market share leader, with more than five times the cloud IaaS compute capacity in use than the aggregate total of the other 14 providers in this Magic Quadrant. In other words AWS has 80+% market share, which is the same market share it had a year ago. Anyhow with cloud adoption exploding—451 Research projects that the current 29% CAGR for IaaS will persist through 2018—the revenue dip cannot be primarily attributable to customers switching clouds. It is much more likely that despite strong growth, their March price cuts of ~20% on key infrastructure primarily caused the 3% revenue dip. In summary, their revenue is down because of price cuts, not because they are losing customers to competitors. I think the right way to frame this question is: does another company offer a better product/price combo that is as easy to buy? The answer is often “no”. As we’ve seen many times, AWS comes to market with a product that is exactly the right balance of cost and features. Sometimes that means a thinner implementation and fewer features than competitive products, sometimes it does not. Regardless, AWS’s products have been remarkably successful, even when they appear to be poor knock-offs. It’s tough for us creators to face, but product excellence is often not one of the most crucial factors in commercial success. Acceptable features for the right price matter much more. It is also much easier to buy AWS once a customer is in the AWS ecosystem, follow-on purchase decisions are streamlined because AWS is now a safe choice (career wise), and security and legal requirements are already known to be satisfied. As above, I think AWS is perfectly tuned to the amount of excellent support most companies want to pay for: almost none. And there are ameliorating strategies if your company requires better support 1) you can pay for it (and sometimes it is even helpful) 2) you can build robust software defined systems a resistant to cloud failures (see Netflix’s chaos monkey) and 3) you can use other services that run on AWS that buffer you from raw AWS (like Mortar for instance, where I work). This is true. But it’s also not clearly more expensive, which means cost is not a deciding factor. 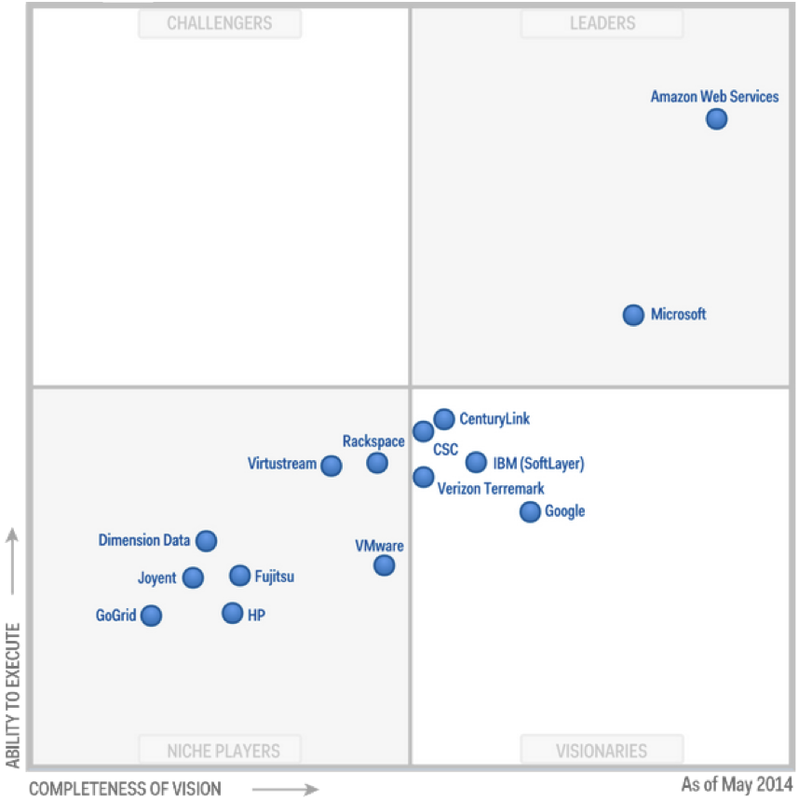 But nonetheless if many of their products are not best of breed and their support is thin, why would you chose AWS? For the reasons outlined above: lots of battle-tested good-enough products, infrastructure that actually works at scale, and easy adoption. I also believe that the competition’s prices are artificially low as they try to gain market traction. But for ordinary computing, there are times when private hardware is cheaper. Dropbox may be reacting to this (or maybe Zocalo). Regardless, Brad notes that technically-savvy young companies spending more than $2M a year on AWS see meaningful cost reduction for bringing a predictable compute load onto private hardware. Isolation of resources: Teams don’t slow each other down by overusing resources (machines), or installing conflicting software. Free speed: For use cases like working with high-scale data where parallelization is common, it is possible to use 100 machines instead of 10, and get it done 10x faster, at the same price. Experimentation: It is possible to try something that requires resources for a day, a month, a year, without going through a heavy provisioning / deprovisioning process. 1-button deploy, redeploy, and rollback: with everything in the stack defined by software, it is possible to quickly make new releases, and when necessary revert to previous releases. Uptime: Globally redundant hardware, plus ability to do releases to full testing or staging environment and then flip a switch to make it production (or ramp traffic from one to the other) dramatically improves uptime without requiring permanent hardware duplication. So moving certain workloads to private hardware can save money, but many of the largest companies are seeing that a hybrid model that allows significant use of public cloud is a crucial part of their strategy. Near-term, I don’t think AWS has anything to worry about — not from competitive products or competitive clouds, and not from private hardware. For this reason, Mortar (where I work) has so far chosen to remain exclusively focused on AWS. I don’t believe competitive products will pose a significant threat. AWS is remarkably good at moving up the stack at the right pace, at the right price. 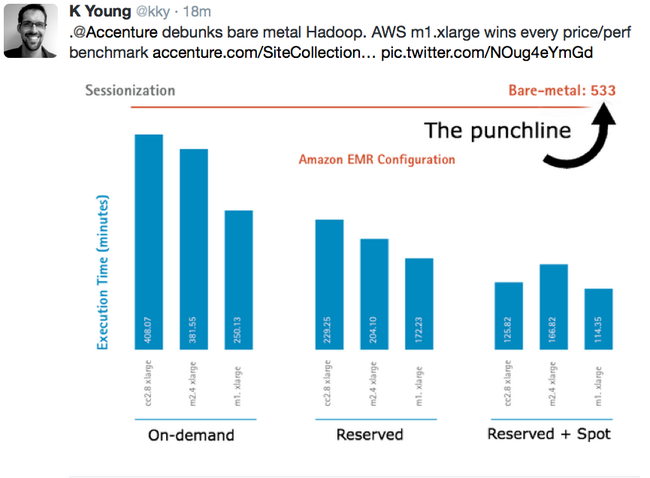 Some outside products will beat AWS’s products—but not many, and not enough to meaningfully hurt AWS. I don’t believe private hardware will slow them down, either. AWS manages hardware in a manner that is highly secure and inexpensive, in addition to all the other benefits true cloud brings (speed, scale, reliability, low-cost experiments). The only thing that I think might slow AWS’s ascent is competitive cloud providers that appeal to the CEO, CFO, CSO, and especially to engineers. But to make a dent, their competition must execute impeccably, and must invest an enormous amount to even begin to catch up with AWS’s 8 year head start and near-total market dominance. Either that, or they’ve got to have some killer features…that AWS can’t replicate at a lower price. I had a chance to talk with Brad Feld about our different points of view about AWS’s ongoing market dominance. We both agree that AWS will remain the budget option, in every sense of the word, for the long haul. But we disagreed about the competitive advantage of that position. I think AWS excels at striking the right balance of price and features (and relying on a huge ecosystem of 3rd parties to provide more upscale offerings), and Brad thinks that a more expensive and more quality base cloud + services may come to dominate.